This tutorial contains instructions to disable Windows Defender in Windows 10, 8 or 8.1 OS. Windows Defender is a free and reliable virus protection program built into Windows 10 and 8 operating systems, so you do not have to turn off Windows Defender unless you want to use another program to protect your computer. However, even in this case, Windows Defender will automatically shut down when it detects that another anti-virus program is installed on the system. In my opinion, Windows Defender is one of the top freeware security programs to protect your system from viruses and malware and you can use it as the main antivirus program to protect your computer. Additionally, if you want to use another security program as your primary protection, you can keep and use Windows Defender as an additional protection. How to Turn off Windows Defender in Windows 10 and 8/8.1 OS. in most cases, Windows Defender protection is automatically turned off when you install a third-party security program and you do not have to perform any additional actions to disable Defender's protection. Follow the instructions below only if you have problems with Windows Defender or if it does not automatically deactivated after installing another security program. The usual way to temporarily stop the Windows Defender protection, is to open Windows Defender Security Center and then at Virus and Treat Protection settings options to turn off the Real -time protection. How to permanently disable Windows Defender in Windows 10 and 8 OS. 1. Turn Off the Real Time Protection in Windows Defender, by using the instructions above. Press simultaneously the Windows + R keys to open the run command box. Type regedit & Press Enter. 4. Right click at the Windows Defender key and click Permissions. 5. Click Advanced and then click Change owner. 6. At “Enter the name to select” box, type Administrators and click OK.
7. 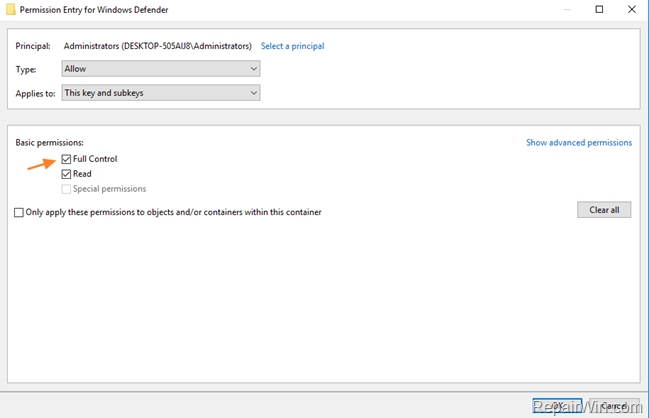 Click Replace owner on subcontainers and objects and click Apply. 8. Double click at Administrators entry. 9. Check the Full Control check box and then click OK three (3) times to close permission properties. 12. At the right pane, double click to open the DisableAntiSpyware REG_DWORD value and change the value data to 1. 13. Then open the DisableAntiVirus REG_DWORD value and change the value data to 1. 15. At the right pane double click at Start REG_DWORD value and change the value data from 2 to 3. 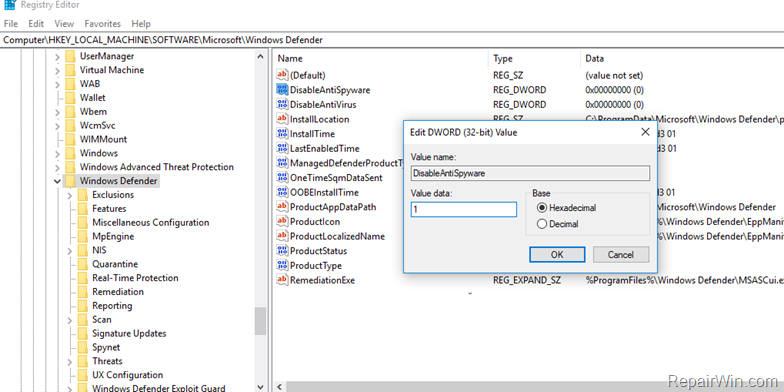 * Additional Tip: If you want to disable also the Windows Defender Firewall, change the Start REG_DWORD value at HKEY_LOCAL_MACHINE\SYSTEM\CurrentControlSet\Services\MpsSvc key, from 2 to 4.